Game Index – These 1988 games were added to the Index: P.O.W. (arcade), RoboCop (arcade), Superman (arcade game by Taito) and Vigilante (arcade) added. The Superman and Vigilante text sections have a bit more content and commentary than many of the other index pages and is something I might try to do more often. 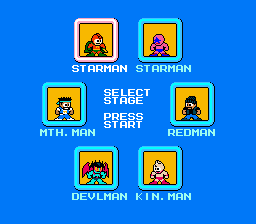 Fakeshot Generator: new Mega Man NES-style sprite edits were added, including Radd Spencer, Nth Man (from Larry Hama’s Marvel Comic) and more DC characters whose name ends in man or woman, plus Dr. Sivana. Articles – I just made some various fixes to the 1989 articles, especially an improved 1989 Game Index list. My plan is to make sure those pages are completely up-to-par before next year, the 25th Anniversary of 1989, the greatest year for video gaming (in my opinion). 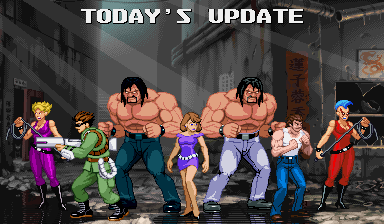 Technos gallery – Linda (new scratch-made pose), Abobo (improved sprites + DD2 version), Williams (hairswap). Mega Man NES-style – a new gallery with all those crappy edits I made for the Fake Screenshot generator. DC Comics – The old sprite edits of Player 2 Superman and the Mystery Woman from the Taito Superman arcade game were finally re-added after being left out when the galleries were redesigned. Wait, you don’t know about the Mystery Woman? Read the Superman entry in the Game Index! Sprites – Superman (sprites and animations from the arcade game) updated. Anarchy Reigns, the insane 3-D brawler by the equally insane Platinum Games (Bayonetta, MadWorld), was released this week. I’ve been looking forward to this game for a long, long time for reasons that you see above. Everything I’ve ever seen about this game looks insane and seems to be geared towards people who love game play. Platinum seems to be one of the last developers to still embrace no-holds-barred creativity in games and they deserve some love for that. I’ve heard nothing but good things from the friends who imported the Japanese version and I’ll be impatiently waiting for my copy. It’s only $30, so it won’t be a terrible hit to the wallet or purse. According to this Polygon article, Capcom Arcade Cabinet will be a series of digitally-downloaded (Playstation Store and X-Box Marketplace) faithful recreations (not emulated) of their earliest arcade games with all sorts of extra features. Players will be able to adjust things like the difficulty and even the hitboxes. For those who haven’t played the arcade versions of those early games in the Capcom Classic Collections, those early games can get notoriously cheap, especially Trojan. It begins with with the platformer, Black Tiger (a.k.a. Black Dragon) and more info is supposed to come out in February. I’m looking forward to seeing how far this program goes and if there will be any cool extras. The original Namco Museum series for the Playstation is still my favorite style of classic compilation and I wonder if these individual games could be a build-your-own Capcom Museum. Like I said before, updates will be slow for a while as I work on the upcoming new sprite. Still, here’s a Tumblr post with a work progress GIF of the Marian sprite I made in the last 2012 update. I also had a post with the Abobo sprites with the work prog GIF and the sprites I used for reference. Graphic Generators – I added 8 new edits to the Mega Man NES styles in the Fake Screenshot generators. The Ninja Warriors 16×16 font in the GroupShot generators was also fixed. Yesterday’s update on Illmosis has the work progress animation for Abobo and the news page talks a bit about what I’ll be busy with for a while. It’s time to get the new member of the Illmosis network up and running. ScrollBoss will still have small updates and the ScrollBoss Tumblr will remain active, too. Shadi added some new pages to his beautiful Arcade Quartermaster website! One of the new things is a shrine section for the X-Men beat-em-up by Konami. If you haven’t checked out his site before, browse the whole thing!